These instructions were created using an LG tablet. 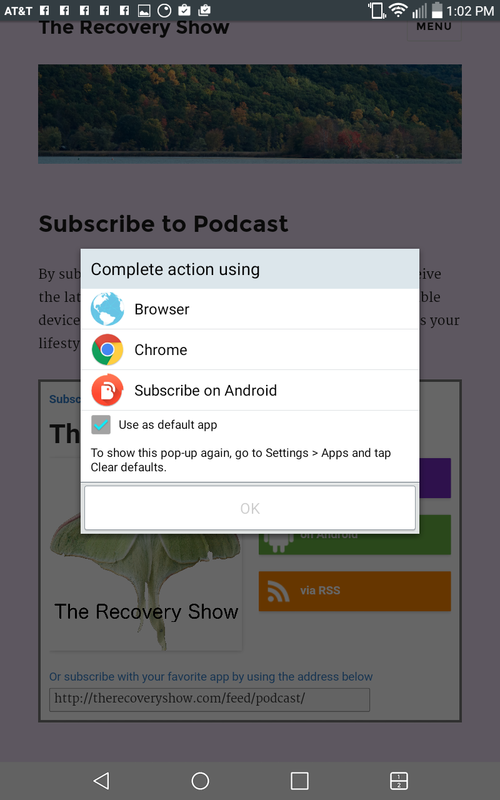 Even if you have a different phone or tablet and a different podcast app, your experience should be similar. You can click/tap on any of the screenshots below to see them full size. 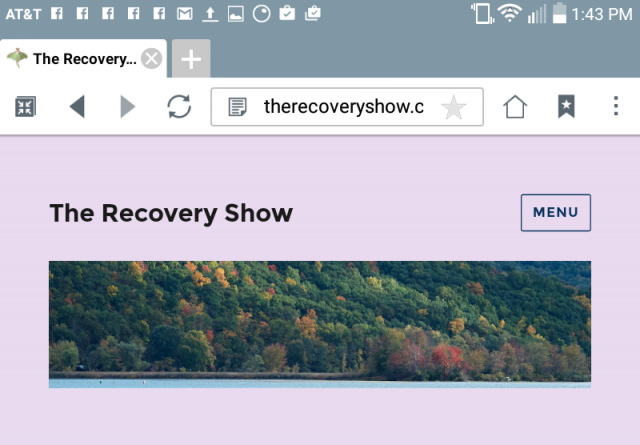 Navigate to The Recovery Show using your web browser. Tap on the MENU box to open the page menu. Then tap on Subscribe to open the subscription page. If you have a podcast app already installed, skip to Step 4. If you do not yet have a podcast app on your phone or tablet, you will be taken to a page with some podcast app download buttons, as shown here. 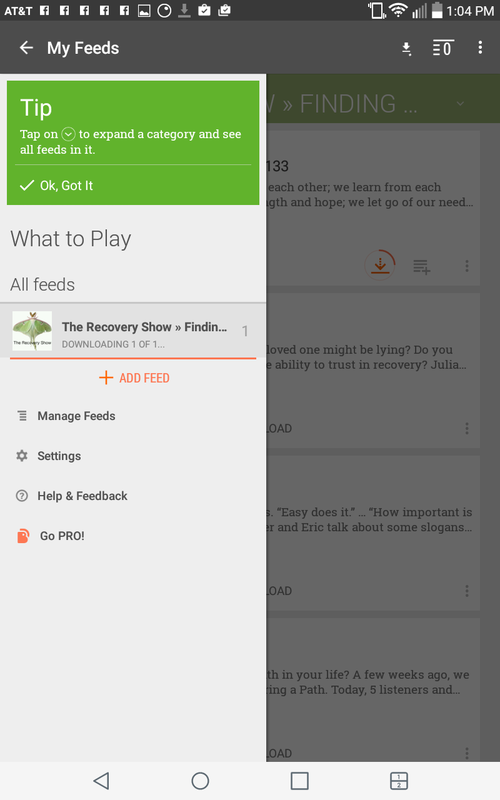 Select the app you want, or browse the Google Play Store to find one. I chose BeyondPod for this tutorial. 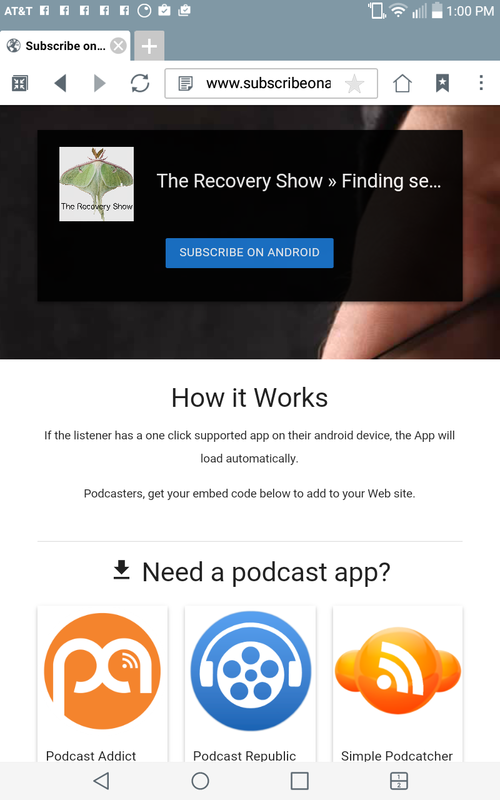 Now go back to the Subscribe page at The Recovery Show, and tap the “on Android” button again. After tapping, you should see something similar to this screenshot. 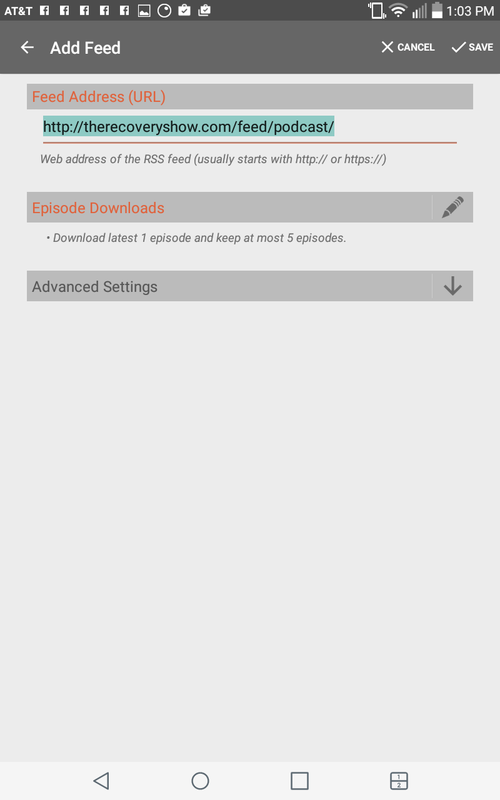 Select “Subscribe on Android”. You can choose to have all Android subscription links open with this app by checking the box labeled “Use as default app”. If you're not sure, leave it unchecked, because then the browser will ask you again next time. For example, if you're evaluating an app, you would want to not check the box until you're sure you are going to keep the app. This screenshot is taken from the BeyondPod app. If you have a different app, your screen will probably look different at this point. You might not even have to do this step. 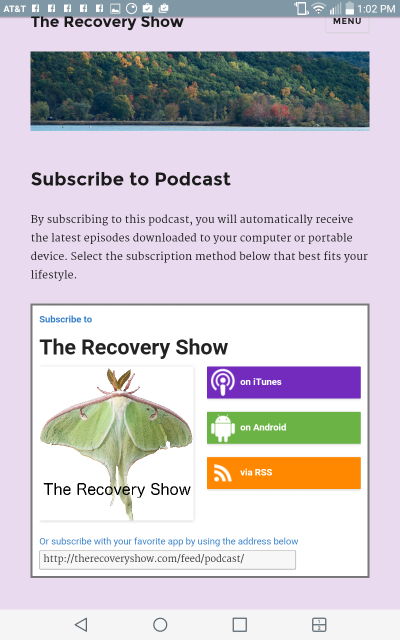 BeyondPod is showing The Recovery Show podcast “feed URL” and the proposed subscription settings. 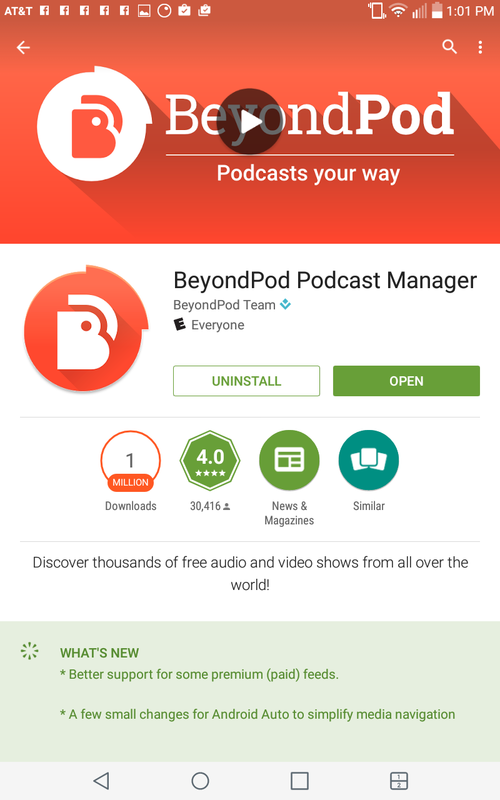 For full details about this screen, you should consult the help materials for BeyondPod. 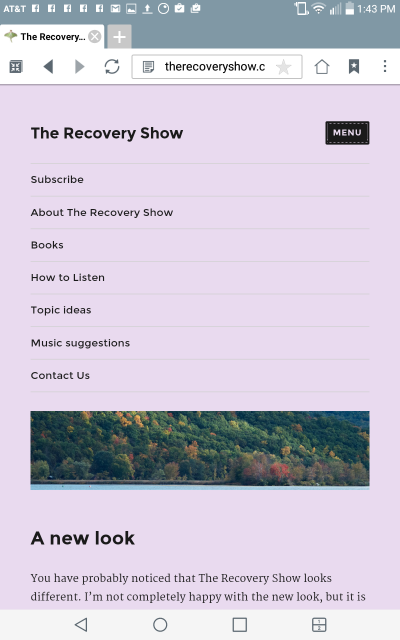 The important thing for now is that you need to tap on the “Save” button to finish the process of subscribing to The Recovery Show. 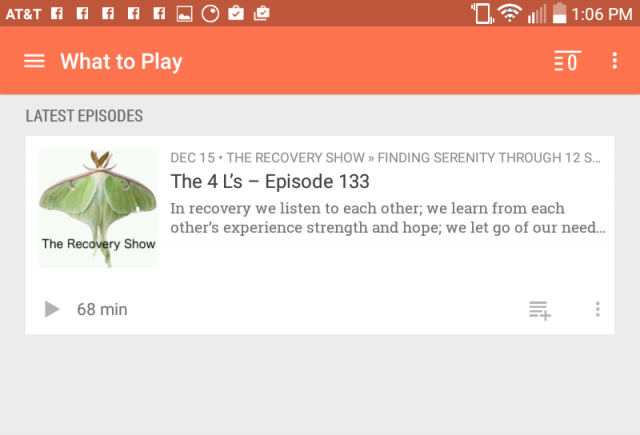 As you can see in this screenshot from BeyondPod, we are now ready to select The Recovery Show and start downloading or playing episodes. After tapping “Save” on the previous screen, I came to an empty page titled “What to Play”. I tapped on the menu icon in the upper left and it showed me this menu. I tapped on The Recovery Show to start downloading some episodes. Again, consult the help file for your podcast app for more details. Now that I've downloaded an episode, I can start listening. 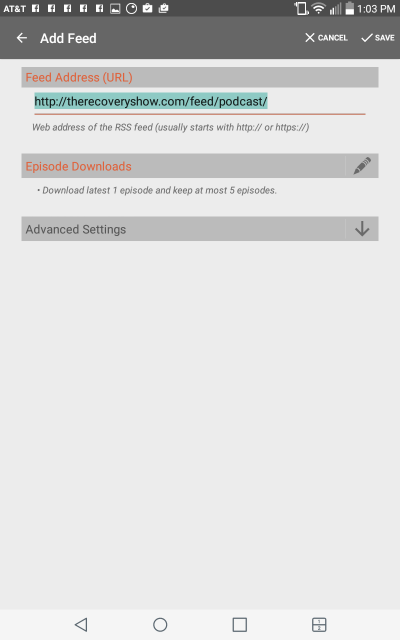 Depending on the download options I selected, new episodes should be downloaded automatically when they are published.